I am determined to read this one this year. I think everyone and their grandmothers have read this, everyone but me. I shall get to this one! You sum up the book perfectly: it's thoroughly predictable but it's also difficult to dislike a you'll-laugh-you'll-cry book like this. I enjoyed it, too. 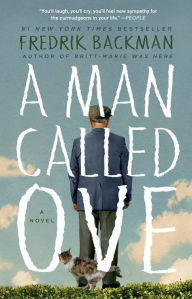 Ove is tremendously popular at my most local bookstore, so popular that Backman came to speak there last summer. I was number 63 in line to have a book signed but I waited (and waited!) because as a translator it's exciting to see such excitement for translated fiction. I, too, really enjoyed this one. Will you read the others by him? You will see some of the same characters. I enjoyed them all. I had the same initial response you had - but you've just about convinced me to read it. Desperate to find something that will just be fun to read! If you have any other recommendations in the "entertaining, but not stupid" vein, please shoot me a recommendation at http://2manybooks2littletime.com. Much appreciated!